Welcome to my beer review! This category has been pretty popular and can have a lot of content at times. As a result, I made beer reviews its own page, with sub pages of a variety of review themes. A perfect summertime brew to help best the heat! The colorful can pours a golden, orange color with a light foamy head. Has the aroma of citrus orange peel and hops. The first sip tickles the taste buds with the fruity flavors passion fruit, orange, and guava. The finish is sightly bitter and hoppy, like you want in an IPA. Excellent thirst quencher with a balance of IPA hop bitterness and fruits! A light amber color pour with a thin lacey head clinging to the side of the glass. A rich malty, sweet grass aroma. Old Detroit is a light bodied ale with a smooth caramely, malty flavor with a sweet hop finish. Harkens back to a time when choosing a beer was simpler, yet also a matter of pride. A barrel aged dark ale matured in the bottle for 1 year before sampling. Pours with a nice thick head and has a pleasant citrus and butterscotch aroma. An excellent beer to sip and relax with, out on the terrace. It has a nice bittersweet taste of molasses, hint of cinnamon, a little woodsy flavor from the oak barrel aging, and a slight alcohol presence. Overall this is a smooth, mellow and creamy ale which should be enjoyed with the same type of background music and atmosphere. We enjoyed this robust porter straight from the can, but poured a sample amount into a glass for color foam review. It is has more carbonation than expected, yet has a creamy smooth mouthfeel. The head is thick and lacy. It has a nice roasted hop aroma and flavor. The finish is bitter like a bakers chocolate. A smooth and not so heavy porter that can be enjoyed while relaxing at the end of the day. For February 2017, the month of love and romance, the retroden reviews Space Dust IPA simply for the love of beer! IPA lovers will definitely enjoy this hoppy and bitter brew under moonlit, star filled skies. With a grapefruit aroma and a thick foamy head, relax in front of a campfire with some friends, or with that special someone. A healthy pour into the skull mug left a thick bubbly head atop the deep, dark brown brew. It had a pleasant balanced aroma of hops, cinnamon, and ginger. Not your typical pumpkin beer, this has a nice blend of spices. A malty mouthfeel, tasted of cinnamon, nutmeg, and pinchyness of ginger. Served slightly chilled, a tasty brew to sip through the night while watching a spooky movie. Just in time for the Halloween season. As the name suggests, its a hoppy red ale. This beer has the light aroma of an IPA that gets your taste buds ready for that hoppy bite. But wait, The first sensation is that of maltiness like an Oktoberfest, then the hops kick in. Not too hoppy, but well balanced. If you like vampires, amplified music, and good beer, you're sure to enjoy this Halloween treat. brewed and bottled at Shmaltz Brewing Company, Clifton Park, New York, in collaboration with Terrapin Beer Company, Athens, Georgia. 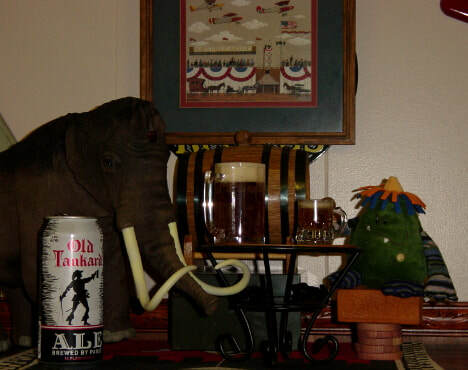 Wooly Mammoth brought this ale to share at Thanksgiving dinner. An excellent choice, as this a tribute to a friend and raise funds for Myeloma and bone cancer research. Brewed with Belgian yeast, and a multitude of additions, like pumpkin, cocoa nibs, ginger, chilli pepper and much more. Don't let the list of ingredients scare you off. The brewers of this special ale have really nailed it. It has a deep dark brown color and a thin dissipating head. Enjoy the pleasant aroma as you approach the glass for that first taste. Immediately there is a good flavor of a dark Belgian ale, with flavors of chocolate, lightly spiced. The after taste leaves a slightly sweet velvety mouthfeel with the presents of ginger and the slightest heat from the chili pepper. All of the flavors continue to come out as you work your way down to the bottom of the glass. Best served slightly chilled, this is a great choice to share with family and friends and give thanks. The Greek meaning of the name Althea is"healing". A portion of the proceeds from this brew go toward helping those undergoing breast cancer treatment. For the Belgian Ale lover, this brew has excellent aroma and color. I enjoyed sipping away at this one on a crisp autumn evening. Best served in a tulip glass, only slightly chilled to allow the full experience of flavors. It had a thin lacy head and nice amount of carbonation. The plum notes only came through as a pleasant underlying aftertaste. I nice crisp and satisfying brew to enjoy on a sunny Spring day. Along with the typical wheat beer notes of grapefruit and banana, Griffin Claw has added coriander to give it a nice and unique compliment. A dark, dark brown pour with a bubblyy tan head. Typical porter flavors of coffee and chocolate followed by a hint of coconut which gives it a slightly sweet finish. Has a smooth, malty mouthfeel and more carbonation than expected. Best served chilled for maximum flavor. A good choice at the end of any voyage!